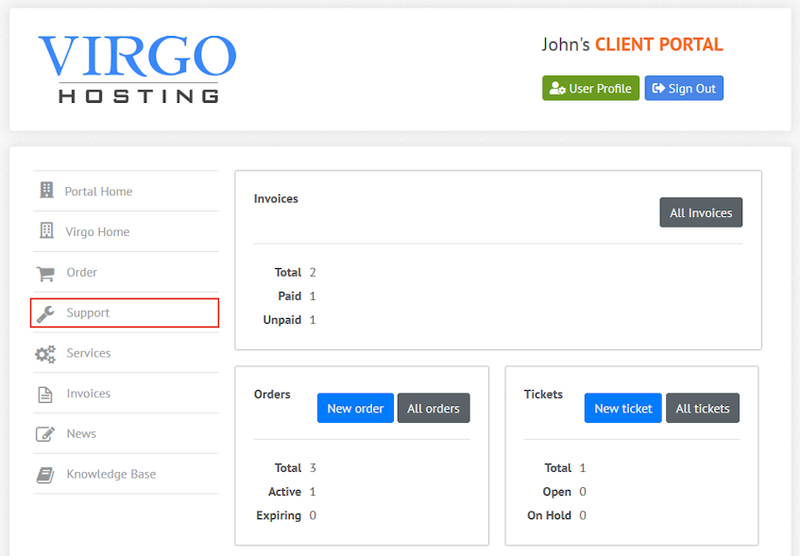 The Support interface in the Virgo Hosting Client Portal lets you manage your support tickets. In the client portal homepage, click 'Support' button in the menu. If you're accessing the client portal from a mobile device, the menu will be accessible through the 'MENU'icon. The support tickets table in the client portal support interface lists your supports tickets and allows you to manage them. "Id" column of the support tickets table shows the support ticket id of your support ticket. "Subject" column of the support tickets table shows the subject of your support ticket. "Help Desk" column of the support tickets table shows the help desk your support ticket was submitted to. "Status" column of the support tickets table shows the current status of your support ticket. "Submitted" column of the support tickets table shows the time since your support ticket was submitted. "Actions" column of the support tickets table shows the available actions for your support ticket. Click "Submit new ticket" button on top of the support tickets table. A pop-up form will be visible. Select the help desk you'd like to submit your ticket to, from the "Help desk" dropdown menu. Select "Sales" option if you need support related to service orders, renewals, upgrades or downgrades. Select "Domain Names" option if you need support related to domain name services. Select "cPanel Hosting" option if you need support related to one of your cPanel hosting accounts. Select "WHM Reseller Hosting" option if you're a reseller and need support related to one of your WHM reseller hosting accounts. Enter the subject of your support request in the "Subject" text box. Enter your message in the "Message" text box. Please write your message in detail, so that we can solve the issue in a timely manner. Find the support ticket you'd like to manage and click the ticket subject in the "Subject" column. A new page will open. "Ticket information" section shows the ticket id, help desk, ticket status and the time the ticket was opened. If you'd like to close the support ticket, click "Close ticket" button you'll find in this section. "Last tickets" section shows your most recent tickets with their subject, help desk, status and time submitted. Click "Back to tickets list" link in this section to return to the support homepage, or click another ticket subject to manage that ticket. The last section is marked with the subject of your ticket. Here you can view the conversation between you and Virgo Hosting support staff, and you can reply to your ticket. Please note that closed tickets cannot be reopened. Please make sure your support request is resolved before closing a ticket.